Last week, Dr. Kee Yeon Hwang, president of the Korea Transport Institute, was in town for two enlightening presentations . SightLineDaily has a good report of this lecture . As noticed in the report, Dr. Kee Yeon Hwang, has insisted on the historically cultural and spiritual (Feng shui) importance of the stream in the Seoul context. Thought that the dismantling of the freeway was a campaign promise of the then mayoral candidate Lee Myung-bak, it is not clear how central this promise was in the campaign, since Dr. Kee Yeon Hwang himself admitted he was not expecting to see this promise fulfilled. 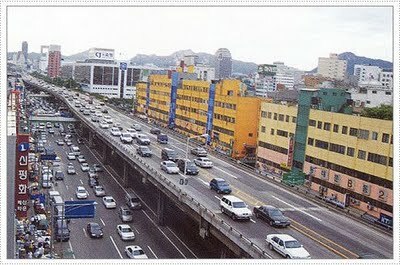 It is not clear too how much of the Seoul electorate was using the freeway versus the suburbanite not participating in the vote. In that instance, Seoulites heavily relying on public transit could have got a different opinion of its suburbanite neighbors, like did the Londoner or Stockholm people on congestion charge, or Parisian on the Delanoë program to close the freeway on the Seine river banks (at least during summer month) and introduce bike and bus lanes in the city. once invested in a mandate legitimated by recent election, civic leaders have to act fast to ensure that the their constituents are able to measure the positive effect of the controversial shift, that in the time of a mandate. 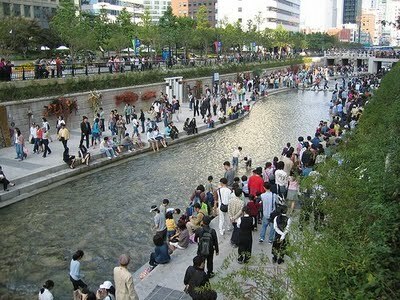 That is what has been achieved by the very controversial congestion charge in London, that s what has been achieved by the bus lanes and other initiatives from Delanoë in Paris, and that is what has been achieved by the restoration of the Cheonggye Stream in Seoul. Another important thing to retain and key to the success of the Cheonggye Stream restoration is that in Seoul, like in New York with pedestrianization of Time square, that has eased the congestion. 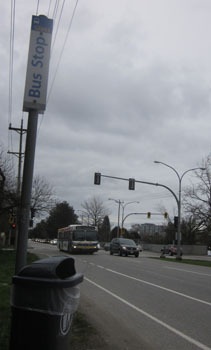 More, the freeway dismantling was part of a package on refocusing transportation on public transit, object of the second lecture presented at Surrey SFU. you will find some materials similar to the one presented in  and . Considering the Vancouver political context, you could have think sensible from the part of SFU to schedule this second lecture in Surrey, since South of the Fraser is well known for not lacking of full time whiner when come to talk of bus service in Surrey and other low density suburbs of the valley. If I have spotted Jonathan Cote, from New Westminster council, I have failed to see any of those SoF “full time” whiners, including their civic leaders in the very scarce attendance. They seems in fact to show little appetite at listening ideas on how to improve transit in their jurisdiction…may be because they follow a different agenda which is more driven by the promotion of a pet project than anything else. In brief, the bus system was built to serve a “captive” market, with little regard for its patrons, and in numerous regard was falling behind the rest of the world standard in many aspect. In the 80’s, Seoul has aggressively developed his subway network- it is one of the busiest in the world- eventually at the expense of its bus system… and global impact on the overall transit modeshare was tiny. It was becoming clearly evident that an “all subway” policy -limited by funding- couldn’t be good enough to address the mobility needs of Seoul. Numerous actions have been taken to change it, the first one being the governance of the public transit system. In that instance, the system was apparently one looking like a “leasehold” bus route offering little flexibility for adjustment in the public interest, and has been changed to one of public service concession of 3 years in length. 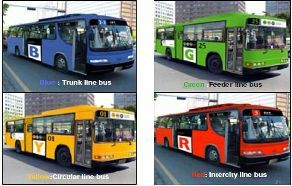 Notice that the later model has became the modus operandi of most of the public transit agencies in Europe and Australia. The list couldn’t have been complete without the introduction of the smart-card, which address the problem of fare integration (transfer). Some of the most visible change have already been discussed in Regarding Place. Lot of expectation was carried with those changes, and aggressive targets was set. the conclusions of the exercise are more dim. While the reform of the bus system has lead to a dramatically improved service on several metrics like bus speed or bus punctuality…in despite of a significant increase in ridership, it has failed to reach the very aggressive goal originally set in that aspect, and eventually has translated in concerns over the subsidiary level of the bus system which is greater than expected. A noticed problem is that the route concession is paid on a mileage bus service basis disregarding the ridership, hence providing no incentive for the bus operator to increase it. But the main lesson is that an extensive subway network shouldered by a massive bus network will never replace the -at least perceived- convenience of car. and at some point you have also to take action to control the usage of it to avoid road congestion, and that is road pricing. What level of public transit is good enough to reach before introducing congestion pricing? VPSN has also blogged on this lecture. Geoff meggs has also written on the topic.